"Your lymph nodes must be as big as cats!" Run Time: Approx. 150 min. 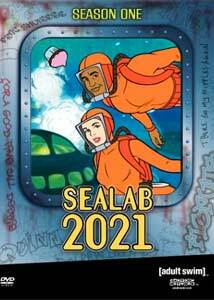 Sealab 2021 has been right at home as part of Cartoon Network's Adult Swim block since it debuted in 2001. The stream-of-consciousness, absurdist humor update of Sealab 2020, a dull, formulaic Hanna-Barbara product from the 1970s, uses old characters and animation to create the kind of perverse, bizarre animated program not seen since, well, Aqua Teen Hunger Force, another Adult Swim mainstay. Aqua Teen was a total original, and Sealab, despite a similar sense of humor (the two share some writers and performers), feels unique as well, though it's not as consistently funny as its more popular brother, particularly in the first season. The characters are funny enough�the crew of misfits is supposed to be working on colonizing the ocean floor, but they seem to be better at engaging in lewd acts with one another, taking drugs, or getting involved in schemes that result in the death of a crew member or, frequently, the destruction of the station (a running gag that ends most episodes). There's Captain Murphy, the senile, paranoid commander; Stormy, the fun-loving, cerebrally-challenged... whatever he does; Debbie (not to be confused with "Black Debbie"), who likes to unzip her wetsuit and give herself some, uh, breathing room; Doctor Quinn, the smartest one on the ship, but really, that's not saying much... Even little Dolphin Boy, who can't speak except in squeaks and who everyone hates (he's often eaten by sharks). Sealab-style comedy doesn't generally earn much respect from critics because it looks so easy—jokes can be delivered as quick nonsequiturs, without setup or justification, and they don't have to be funny as long as they're weird, because your audience will probably laugh anyway, lest they think themselves uncool for not "getting it" (aka The Family Guy). Aqua Teen pulls this off fairly well, and Harvey Birdman: Attorney at Law does one better by positioning itself as a satire of all of those old Hanna Barbara cartoons, but Sealab is less structured, and as a result, when episodes miss the mark, they really miss the mark. Thus we have very amusing entries like the plot-heavy Little Orphan Angry, in which a con artist visits Sealab pretending to be a little sick boy from the Final Request Foundation, prompting germ-phobic Murphy to isolate himself from the possible threat of bubonic plague, or Lost in Time, which pokes fun at the sci-fi time paradox cliché. Then there are the more random entries, which I found tiring, particularly Waking Quinn, in which the title character hallucinates repeatedly after being electrocuted (repeatedly) by Stormy. Trippy, not funny. And the interminable All that Jazz, a parody of, of all things, an episode of Magnum, P.I., in which Murphy gets trapped under a talking pop machine and befriends a scorpion. It's an example of the show at its worst, as grotesque animation and violence (Murphy is stung multiple times and his teeth are repeatedly knocked out by a malevolent robot) replace anything resembling actual comedy. The episodes are fairly brief—around 11 minutes without commercials—and that is most definitely a good thing. The plots, as such, are rarely substantial enough to last that long, let alone a full half-hour. And amusing as the clunky animation and off-the-wall jokes can be, the self-indulgence can be a bit much (particularly when the writers go for the old "very lengthy awkward pause" gag, which is pretty often). While it's nice to have Sealab on DVD, for me it's much more digestible in small bites. Image Transfer Review: Sealab 2021 is a bit of an odd duck when it comes to reviewing video quality. Much of the show's footage is heavily manipulated animation from the original, decades-old Sealab 2020. As a result, colors can look faded or dirty on the characters, even while newer backgrounds appear brighter. But the DVD preserves this look, rather than causes it, so it's not really a quality control matter. In terms of the source material, then, these DVDs look fine, and likely a fair bit better than on most cable connections. Audio Transfer Review: Audio is presented in a fair 2.0 mix with good definition across the front soundstage, infrequent directionality and stereo separation, and minimal input from the surrounds. Extras Review: Extras are pretty light for this two-disc set. There are alternate endings for I, Robot, and "uncensored" scene from Radio Free Sealab, and several alternate scenes from Little Orphan Angry. The only other extra is the original pitch pilot, presented to Cartoon Network as a proof of concept. It's pretty rough and not very funny (though a few of the jokes were eventually used later), but it was good enough for the network to buy the show, so what do I know? Each episode is a separate chapter stop. There are no subtitles. I don't know if Sealab 2021 is smart because it pulls off stupid humor and absurdist wit, or if it's just... stupid and absurd. But it is pretty funny sometimes, if you're so inclined. The DVD set is a little pricey, though (and discounts are few and far between), so only pick it up if you're already a fan.